When I say “ramen” I bet most of you are picturing 99 cent packages of dried noodles with the saltiest powder you will ever put on anything. Well no. You are wrong. That is as much ramen as McDonald’s is to a good, real hamburger. Nope. That won’t do. 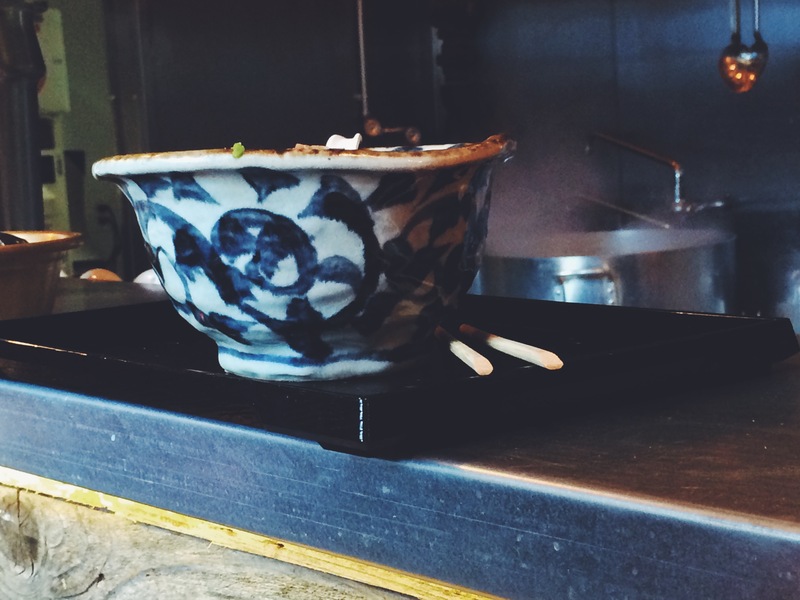 So let’s reset your mind with authentic ramen, the way the Japanese invented it. 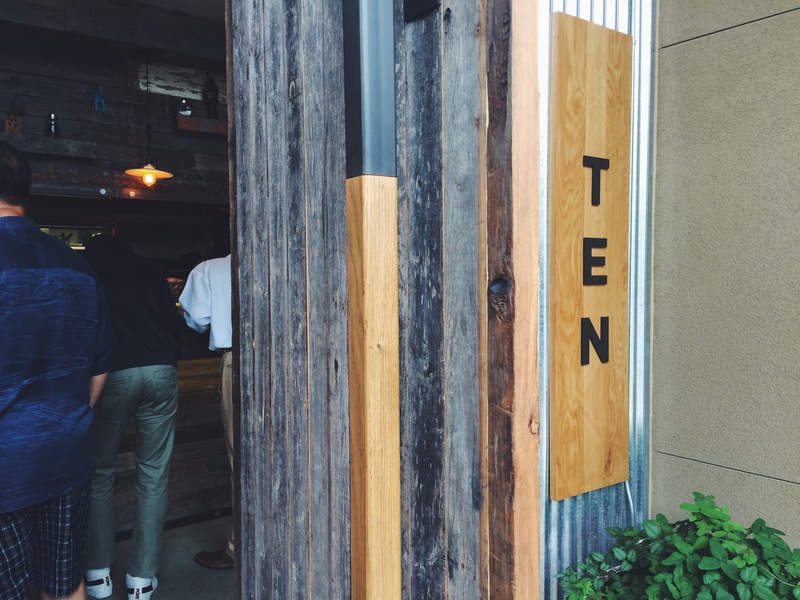 And the best way for Dallas to do that is at Zagat-rated Ten Ramen. The much anticipated opening by chef Teiichi Sakurai of Dallas’ own Tei-An has been well received. 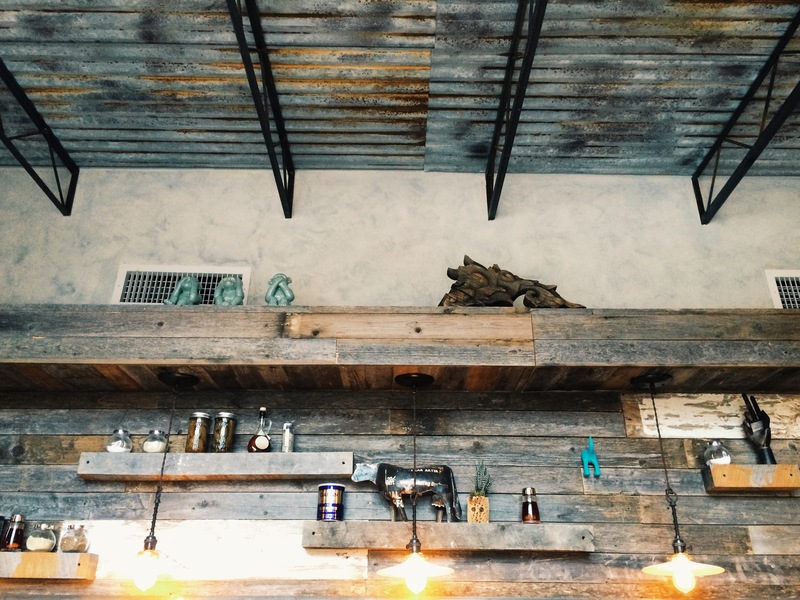 Hidden away in a small corner at Sylvan Thirty in Oak Cliff is this gem. A gem that will not be hidden for long. It has only be open for about a month and the tiny place was already bustling with people eating inside and spilling out of the doors. When I say tiny, I mean tiny, holding only maybe 10-15 people standing at a time. Oh yeah, there’s no tables, just bars to stand and slurp your noodles at-the way ramen bars in Japan are run (this is where all of the fussy people whine). It’s really the whole ramen experience, like you’re not really in Dallas anymore. There are a few more bars to stand at outside of door of the restaurant, for the already existent crowded moments. 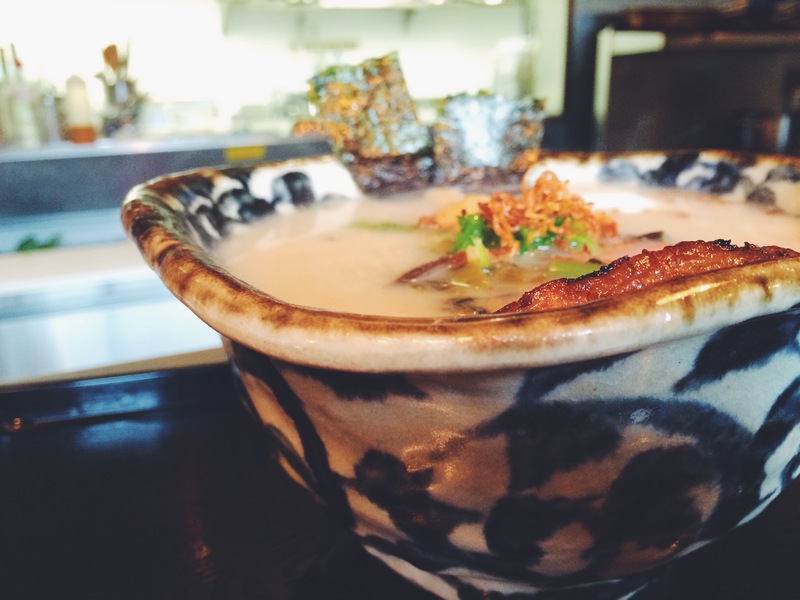 The benchmark ramen you should try is the tonkotsu ramen. A pork based broth with chashu (pork) that has been sous vide and then chargrilled, noodles, nori (seaweed), pickled ginger, kikurage mushroom, takana (mustard greens), and menma (bamboo shoots). I also added an onsen egg (poached) which I feel is a necessity to any bowl of ramen. We placed our orders on the touchscreen tablets and waited anxiously at the bar for our names to be called. It didn’t help that my friend and I hit the gym immediately after work and were ridiculously hungry by this time! In the meantime we were able to watch the chefs in almost choreographed motions compose our delicious bowls of ramen, which distracted us from our hunger. Finally, we got ours and didn’t hesitate to dig in! There are chopsticks and spoons. You will slurp, it’s what you do, honestly. It’s better that way. There is chili oil and fresh peeled garlic accompanied by garlic presses, to add to your ramen as you would like. We stood shoulder to shoulder with the other hungry patrons and inhaled the noodles and flavorful broth over quality conversation. We kept entertained by the speedy chefs preparing endless bowls of the soup right before our eyes. Don’t forget to eat it all, as if it will be difficult, because there are no to-go orders at this place, it’s only dine-in here. We stuffed ourselves before basically rolling out of the place. I was highly impressed with this place. After trying ramen at other shops in Dallas and even in NYC, I can say that this is a solid bowl. Not to mention the bowls themselves are unique and interesting. It was worth the $13. 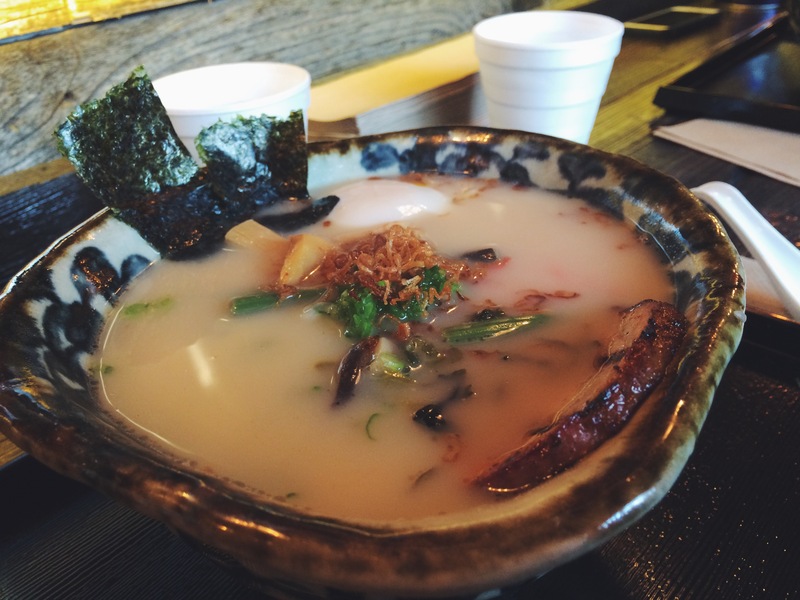 Also, they have several ramen offerings: Shoyu (soy based broth), ramen of the week on constant rotation, Pork Mazemen which is like broth-less ramen, and a couple of rice and pork dishes. That’s it. Keeping it simple. But it’s better to do fewer things really great than a bunch of things with mediocrity. You can physically check them out at F100, 1888 Sylvan Ave, Dallas, TX 75208. There isn’t a website (yet?). Go there, now, eat. Just do it. You won’t regret it.